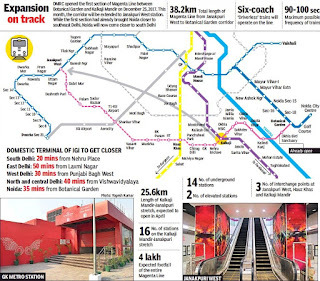 The Kalkaji Mandir-to-Janakpuri West section of Delhi Metro’s Magenta Line is likely to be opened for use next week. A 12.6-km section of the corridor between Botanical Garden in Noida and Kalkaji Mandir was inaugurated in December last year. The remaining section, when opened, will put Vasant Vihar, Munirka, Indian Institute of Technology, Greater Kailash, Chirag Dilli and other localities in south Delhi on the Delhi Metro map and bring this region of the capital closer to Noida and west Delhi. The domestic terminal of the Indira Gandhi International Airport will also get a metro link for the first time. The Hauz Khas metro station will become an interchange station and provide inter-connectivity for the Yellow Line (HUDA City Centre-Samaypur Badli) and Magenta Line. Through this connectivity, the travelling time between Gurgaon and Noida will be brought down by at least half an hour to around 50 minutes. The Janakpuri West station on the Blue Line (Dwarka-Noida/Vaishali) will similarly become an interchange station and provide additional access to areas in south Delhi and Noida from west Delhi. The interchange will take place at the first station of the new Phase 3 corridor and will connect the Blue Line with, among other, Terminal 1 of IGIA, Munirka, Hauz Khas, Nehru Place and Botanical Garden in Noida. 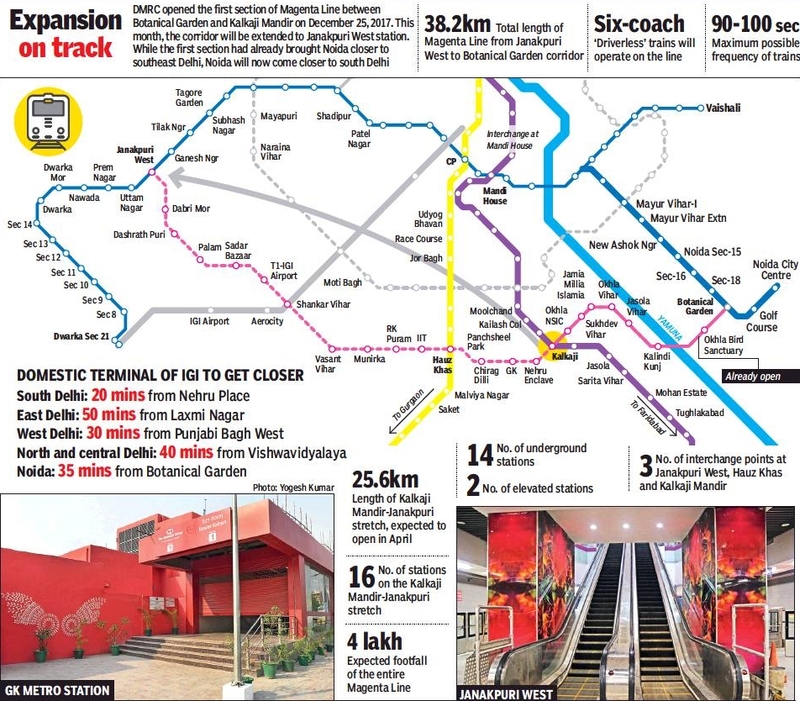 For lakhs of west Delhi residents, their one connection to the rest of the city is the Blue Line, but this involves travelling up to Rajiv Chowk and changing trains if they are to visit other parts of Delhi-NCR. This will change because the new corridor will pass through and connect heavily populated areas like Palam, Dabri, Mahavir Enclave, Sagarpur and Dashrathpur. IGIA also become more accessible. While the Airport Express Line has a stop at Terminal 3, there was no metro connectivity for the domestic terminals from which the low-cost operators fly. Now, the domestic terminal can be reached from most parts of the capital and also from Gurgaon and Noida, thanks to the many interchange points that allow changing to the Magenta Line. For passengers coming from south Delhi areas, the journey to the airport will now be of just 20 minutes’ duration, while from other parts of the National Capital Region, the commute could take between 35 and 50 minutes. While Delhi University got metro connectivity years ago, Jamia Millia Islamia was also put on the metro map last year when the first section of the Magenta Line opened. 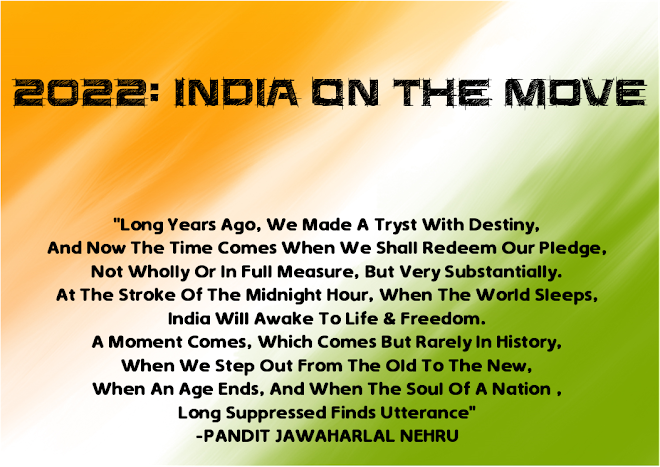 With the opening of the second section of the line, Delhi Metro would also come close to Jawaharlal Nehru University with a station at Munirka, a stone’s throw away. The Indian Institute of Technology, on the other hand, is getting a station named after it right next to the campus.